"The future of Hong Kong should be decided by Hong Kongers" Netflix has revealed an official trailer for a documentary titled Joshua: Teenager vs. Superpower, telling the story of Joshua Wong, the main activist who organized and lead the famous "Umbrella Movement" in Hong Kong back in 2014. This film premiered at the Sundance Film Festival earlier this year, and won an Audience Award in the World Cinema Documentary Competition section. I saw this there and totally loved it (read my glowing review). It's more about Joshua and who he is, and the way he was able to rally an entire city behind him, not so much about the Umbrella Movement itself. Though it does tell the story, and it does have some amazing footage, it's more inspiring to learn about who Joshua (and his friends) are and why they're so into politics and activism. When the Chinese Communist Party alters its promise of autonomy to Hong Kong – handed back to the Chinese government from British rule in 1997 – teenager Joshua Wong decides to fight for his homeland. Rallying thousands of kids to skip school and occupy the streets, and without a long-term plan but with passion to spare, Joshua becomes an unlikely leader in Hong Kong. 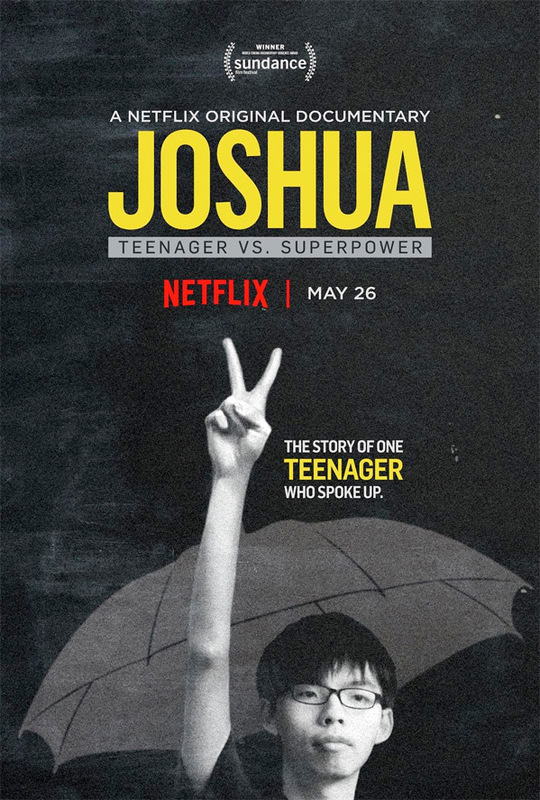 A remarkable portrait of courage, resilience, and the propulsive power of youthful idealism, Joshua: Teenager vs. Superpower, the winner of this year’s Audience Award at the Sundance Film Festival, is a chronicle of one young man risking his own future for a greater good. Joshua: Teenager vs. Superpower is directed by filmmaker Joe Piscatella, of the doc #chicagoGirl: The Social Network Takes on a Dictator previously. This first premiered at the 2017 Sundance Film Festival this January, where it won an Audience Award. Netflix will release Joe Piscatella's Joshua: Teenager vs. Superpower streaming exclusively starting on May 25th this month. Don't miss this!